4 serves of dairy to reduce falls and fractures? There is no doubt that experiencing a bone fracture can be inconvenient as well as painful. However, for older adults a fracture can seriously impact on quality of life and may lead to further health complications. 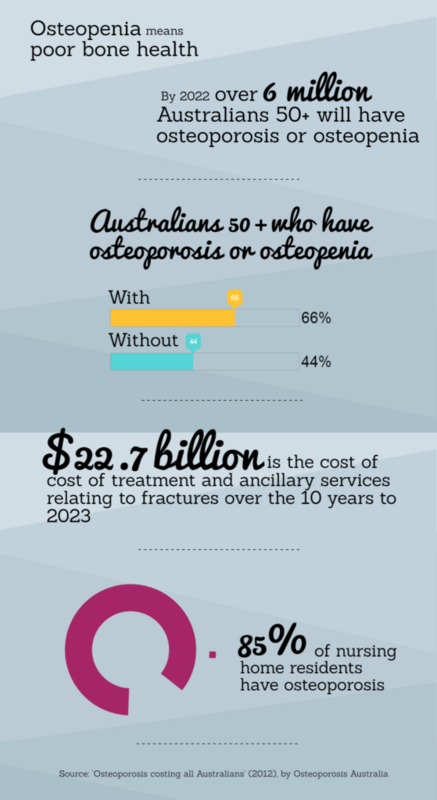 In its 2012 publication entitled ‘Osteoporosis costing all Australians’ Osteoporosis Australia reported that 66% of Australians over the age of 50 have osteoporosis or osteopenia (poor bone health). By 2022 it forecasts there will be over 6 million Australians in this age group with these conditions. The report emphasizes the urgency of taking action and highlights the financial burden of not doing so. According to the report’s findings the total cost of treatment and ancillary services relating to fractures will amount to a staggering $22.7 billion over the 10 years to 2023. Older people living in residential aged care facilities are at considerably higher risk of suffering fractures than those living in the community. Research has shown that 85% of nursing home residents have osteoporosis and that 40% of all hip fractures occur in this population¹. There is an increasing awareness of the importance of nutritional intervention to address the primary causes of frailty, with particular emphasis being placed on daily protein intake. A group of Melbourne researchers is leading a world-first study into the use of dairy foods to reduce the risk of falls and fractures in residential aged care facilities. The two-year trial, believed to be the largest of its kind in the world, involves 4,500 residents living at 60 facilities in Melbourne and regional Victoria. Much has been written about the importance of dietary protein for maintenance of muscle mass. But how many amongst us know how much protein we should be consuming, when to consume it or what source is best for us? In Australia the current RDI (Recommended Daily Intake) for protein is around 0.8g per kilogram of bodyweight. However, several studies conclude that 1.2-1.5g/kg is a more appropriate target for older adults and a recent study carried out by the University of Arkansas for Medical Sciences¹ concludes that increasing this to around 1.8g/kg is needed to achieve maximal muscle. So, for an individual weighing 70kgs that would mean a suggested daily protein intake of 126 grams. Compare that with Australian food labels which calculate a food’s protein contribution based on 50g of protein being 100% of RDI, as directed by the food regulator FSANZ. It’s easy to see why many think they are consuming adequate protein when this may not actually be the case. What about timing of protein consumption? A study undertaken by researchers at the University of Texas² illustrated the significance of spreading intake evenly throughout the day, to achieve optimum muscle protein synthesis; say, 25-30g of protein at each mealtime. This may present quite a challenge to many, particularly at breakfast time which is often a carbohydrate-rich meal (e.g. cereal, toast)ᶟ. The effectiveness of protein as we age is also impacted by its quality and our ability to digest it and thereby benefit from its muscle building properties. Animal proteins tend to be richer in the essential amino acid leucine, which is important for muscle protein synthesis. ‘Fast’ proteins such as whey in liquid form (e.g. a milk-based beverage) also tend to be easier to digest. As our body’s ability to metabolise protein changes, we would be well-advised to carefully consider our dietary habits. Quality, quantity and timing of protein intake each appear to be important factors when considering how best to support healthy muscle as we age. ² Dietary protein recommendations and the prevention of sarcopenia. Douglas Paddon-Jones and Blake B. Rasmussen. Curr Opin Clin Nutr Metab Care. 2009 Jan; 12(1): 86–90.